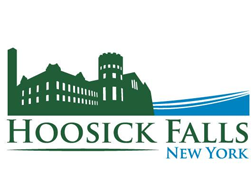 The Village of Hoosick Falls Water Quality Reports are posted annually. Through NYS mandate, every home or business on the Village Municipal Water System must have an operational water meter installed. Failure to have a working meter installed, or tampering with a meter for the purpose of fraud, will result in a citation and fine. The water department does not need to enter a home or business to read the meters for gallon usage or proper operation. Meters are read by an electronic unit that picks up the signal emitted by each unit. If you feel that your meter is not operating properly, contact the Water Department Superintendent. If a faucet drips at a rate of one drop per second, you can waste 2,700 gallons per year. Check for leaks in a toilet by adding a few drops of food coloring to the tank. Coloring will appear in the toilet bowl if it is leaking. When replacing an old toilet, purchase a water-efficient model. Don't let the water run in a bathroom sink when brushing teeth or shaving. Run the washing machine only when it is fully loaded. Check the hoses for cracks that could result in leaks. Turn faucets off firmly. Check and replace any worn-out fixtures, washers, O-rings, and hose connections. Run the dishwasher only when it is fully loaded. Garbage disposals require lots of water to operate properly, avoid using them when possible. With pools and spas, repair any leaks. An inch a day loss in a pool can be over 600 gallons. Get a pool cover to reduce loss of water by evaporation. Always use a hose with a shut-off nozzle installed, and shut off hoses when not in use. This is one of the biggest sources of wasted water. Read your water meter before and after a 2-hour period when no water is being used. If the meter doesn't read exactly the same, you have a leak. Concerned you have a non-functioning water meter? "All water meters are tested to American Water Works Association standards. The water meter must test 98.5% to 101.5% in order to pass the test. Results are then sent to the municipality. We work very closely with the Department of Health in order to provide customer satisfaction." These rates are effective September 1, 2012 and may be subject to change without notice. For your convenience, some of our most-requested documents are available for download in PDF format. Did you know? The Village Water Department does pool filling. If you would like to use a hydrant to fill your pool, contact them at 518-686-0200. The rate is $100 for hooking up to the hydrant and monitoring the fill plus the water rate per thousand gallons, $4.50. This will save you time and money over alternative pool-filling services. 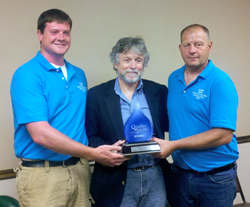 Josh Magizano, Former Mayor David Borge, and Water Superintendent Jim Hurlburt with the award. The Hoosick Falls Water Treatment plant has been honored by the New York Rural Water Association as Rural Water Treatment Plant of The Year. Congratulations to Jim Hurlburt and the staff at the plant for a job well done! Hoosick Falls' water has been named the best tasting water in Rensselaer County once again. Our water has also done well enough in regional competitions to make it to the finals at the New York State Fair. We'll toast to that! 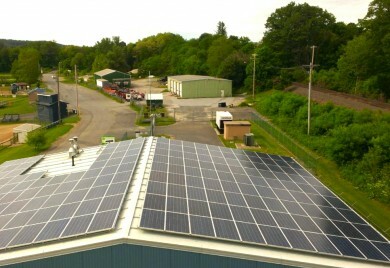 The water treatment plant is the first of the Village's municipal buildings to have fully-operational solar energy panels installed. The plant has a 45 kilowatt system that will generate the majority of their power needs. © 2011- The Village of Hoosick Falls, NY. All rights reserved. | Contact the webmaster.